Payday has come around again. I was broke two days before I got paid – funny that. I fixed up my accounts this morning, and bought a Tomtop powered USB hub, for my Kinect (which hasn’t been plugged into the OctoPrint print server yet), and a Z-Wave USB stick from smarthome.com.au. Next paydays assignment, should you choose to accept it – Cooking Hacks Bluetooth Extreme module. Getting OctoPrint to run on my CubieBoard was a snap – essentially, Linaro (Lubuntu core, actually) and Raspbian are pretty similar. It would’ve been a headache if I was using a Fedora OS, I’m guessing, but because both Linaro and Raspbian are Debian type OSes, I guessed that my Cubie should be able to run OctoPrint. Of course, it was a struggle to get it going on Linaro, I didn’t even have GCC or Make. Oops. Once all the dependancies were fulfilled, it just came up. Wicked! The print server is running off a 13.8VDC power supply at the moment (the “shack” supply, for when I was playing with radios more), through a whole heap of cigarette lighter plugs and sockets, then though a 5VDC USB car charger, with a 2.1Amp, and a 1Amp output. Its meant for powering both your tablet and your phone in your car. I just find it bloody useful! Two USB out, and one of them 2.1Amps – gold! With the long term supply of the print server, no, I won’t be using that shack supply forever, although it’ll live in the rack as a backup. Very soon, I want to go over to a “true” UPS system, based on a Winston/ ThunderSky 12VDC 90Ahr battery, a 60Amp Pro Mariner float charger, and a 600Watt PowerTech inverter for the stuff that really does need 240VAC (which is the ToughSwitch PoE switches, and the HDMi TV monitor for the print server). The rest of the equipment in the rack runs at either 12VDC or 5VDC – Extremely Low Voltage. Now, normally, you’d need no real special qualifications to use ELV, its considered “safe” in terms of voltage – however, short out that battery, and you’ll know the meaning of fire and brimstone…! I’ve seen car batteries with cranking currents of 300Amps shorted out with a spanner when taking the terminal leads off – lets just say the spanner was vapourised. So it pays to know what in the Hell can go wrong, before playing with stuff that can release combustible fumes. And no, I don’t mean when they’re charging, I mean when they’ve been abused – over or under charged, or shorted out. I need a dry chemical fire extinguisher in here – not only for the battery, what if one of the printers decides it doesn’t like me? Plastics sure don’t like water as well as chemicals and oils. So, to speak of my qualifications, well, I do have a cabling licence for a start, meaning I can play games with ELV legally. Then I have a single phase plug replacement licence. Then, way back in 2005, I did a module at engineering school entitled “Telecommunications Power Systems.” Yes, yes, it was 48VDC stuff, but apart from voltage, you know if you short it, something bad is going to happen. So 5VDC and 12VDC is pretty much the same. Not many people would have these qualifications, but I do. Unusual, but the way my life has wound around, I guess. Its nice to put all that knowledge of exchange power systems to work at last. Of course, this is my exchange. The next thing I’m going to get is a 12VDC power switch from the States. Yeah, its a bit, and good old Mr Customs will want to have a nice long chat to me about the money I owe him for it. But its exactly what I need. It allows network control of the switching of DC powered devices (up to 10Amp per channel, out of eight channels), and has a “ping watchdog” which’ll ping the device, if the device doesn’t answer back in a certain period, it’ll cycle the power, and allow the device to reboot. Almost like an external watchdog, totally needed for embedded devices that’ll run day in, and day out. Realistically, I won’t be switching on and off the devices all the time, in fact, if I’m doing that, then I know I have problems, like theres been a power blackout for more than the two hour runtime of the battery backup. Its a last gasp measure to keep the absolutely essential VoIP server alive for as long as possible, along with the switch that’ll provide power to the wifi APs, and the VoIP desk phones. Literally, the printer/ power server will “sacrifice” itself to keep those VoIP systems going. So, an unknowable future, but the trend is towards VoIP in an NBN age. Of course, as I’ve mentioned, your fancy VoIP server and phones all become fancy paperweights if there is a blackout, and you don’t have any backups at all. And for me, an APC “in-a-box” system doesn’t quite cut it. I need to be able to control all parameters of the operation of the UPS system, and know if theres going to be any issues, where those issues are, can they be isolated quickly, because this system is my family’s last link to civilisation, and I take its continued and uninterrupted operation very seriously. And don’t tell me about mobile phones – unreliable, dodgy pieces of crap. I’ve had more phones go flat in an emergency situation, or drop out, than I care to remember. The panic when that link is gone is always unbearable. And I fastidiously charge my phones every night, even if they tell me they don’t need to be charged. I know smartphone battery consumption, and Murphy’s Law all too well. My system is meant to get around Murphy’s Law. This is all basic, academic, planning. Redundancy is a big thing in situations like this. Ok, I won’t have two VoIP servers, or two backup power systems, or anything like that, but who knows? One day I might replicate the system to have an active failover, an N+1 redundancy. It isn’t needed right this instant, plus I’ve run out of room in my rack! But that is a thought for the future. You want to know the best thing about this system? Theres only about four fans in the whole system, and they’re temperature controlled. If I plug in the 48VDC rectifier (ably acting as a shelf in the bottom of the rack at the moment), then I’ll have noise, but the rest of the low powered gear doesn’t have fans, or if it does, they cut in at high temperatures, not run all the time. That means my rack can live next to my room, and be powered on all the time, and I do get a good nights sleep…! That makes me a happy man. As you can tell, I’m listening to Xe-None, the Russian cyber rock band, and it is quarter past five in the morning here. Since I’ve been taken off the heavy sedatives, I’ve found I only sleep five or six hours a night, and I have since found out this “bad habit” is one I share with my father, God rest his soul. I find it fascinating, I was never like this as a child, I slept at least eight hours. I’ve been asked to investigate stereo-lithographic plastic extrusion technique. Jason got himself a RepRap printer, and had downloaded the requisite software. Another triumph of open source hardware – what was $30,000 five years ago, with $5,000 software driving it, and another $5,000 every time you upgraded your OS in order for your big investment to keep working, is now $800, and Hell, its a kit you put together! Tell me what the first thing I thought I could print was? Turns out, yes, you can indeed print model trains. I have access to some 3D .STL models of trains, and some other .3DS models I’m hoping to convert (one is animated – the doors open and close… don’t think I can print that somehow). I have a Windows 8 tablet in order to do the 3D modeling work. Uh huh, I’m full of surprises now – Windows! I’m reserving my opinion on Windows, its just a tool. Like a screwdriver. Some tools I like, like soldering irons. Others, like saws, I don’t particularly like. Others again like power drills, I am afraid of. But at the end of the day, like them, hate them or fear them, they’re still an implement to do work with. So Windows. Oh Shane, what are we going to do with you? I’ve had discussions about using acetone to “smooth off” the models I print – as I print models, I hope to experiment with this technique. And I’m building something special: a printer server for 3D printers. I’m going to use a new embedded board called a pcDuino, which is a modification of a CubieBoard that has Arduino level pins – however, they are not in “shield format” (which is pretty much an industry standard now). When an adapter board comes out, I’ll be getting one of those too. As you can see, this is going to be a busy little computer! And it’ll draw 2Amps max, with a powered USB hub drawing 1Amp max. It’ll live in a rack with my VoIP and radio servers. If I get solar power, it’ll talk to the solar system as well! This servers focus is power monitoring and control, and monitoring and control of the printers. Solar power will not be mounted to the house, I have a concrete pad next to the side of the house I might be able to build a rack of metal tubing to support the panels on. I’ve got to find a good NAS now with some good Samba support, and set up the tablet, the printer server, and my Macbook to use it. Macbook will be used for admin, of course. That NAS will live in the rack as well, backed up off the “true” UPS. Most of the equipment in the rack is at Extremely Low Voltage levels, either 5 or 12VDC. Only three switches and a monitor will be at 240VAC, as well as any NBN equipment when the NBN comes to town. I’ll power the 240VAC gear through a 600Watt inverter. Now, I’m not an electrician, but I’m the next best thing: a licenced cabler! That means I have a legal right to play with ELV gear, mostly in the context of telecommunications, but this power application is well within my reach. And in the future when I’m making some money, and Grace is here, I’d like to take my solar designers accreditation. Andrew said he’d help me with the solar stuff in the meantime, but it would be nice to be able to design stand alone and grid connected solar systems. The printers, of which I plan to have eight, are RepRap Prusa Mendel type printers. And I plan on getting a desktop 3D scanner as well, made by a company called CADScan, who are based in the UK, and are holding a Kickstarter event. The 3D scanner scans directly to .STL files, which can be “sliced” into GCode from there. Of course, there is a downside – I have to put away my train layout for the time being while I make plastic objects, not only trains, but other things that Jason and I are designing. However, I am certain that Jasons ideas will make money, and having a way to make plastic objects without an expensive mould is certainly tops! I’m even going to be using the bio-degradable properties of PLA plastic! This is only early days yet for this project, and it needs a bit of funding yet. Some of the parts haven’t even been made yet, but I expect them to, or I might be able to make them myself. The returns though, I’m guessing, are going to be quite good. I have sources of Buhler train motors, NEM couplers that fit into KaDee coupler pockets (some Russian modelers prefer NEM, like me, others prefer knuckle couplers – I’ll have both with my models), I can print parts of the mechanisms such as the gears, and I have a friend in Melbourne who might show me how to air brush the models, especially if I take him and his missus out for dinner. So as you can tell, its all happening! This plan is clear in my head, as with the NBN education plan (which stalled because I found out the education I was going to do wasn’t NBN accredited) I know where I’m going and what I’m doing. There is no doubt in my mind anymore. I hope to be able to write up my experiences with OctoPrint, and my power monitoring soon enough…! So I’ve been cruising around the net, throwing search terms into Google (oh, I so shouldn’t that that – especially in Russian), and found out the picture of my “bomb case” is number 17 on a Google image search – see last post for the cable spaghetti. I’ve also found some cool links, and had a think about my GSM mobile phone project. So one day, I do want to run my own GSM network. Yup, uh huh, for test purposes only. Into dummy loads. Crap like that. I don’t want to be “Black Rock City Cellular.” Hah. Yeah, I could do without a lawsuit for “not carrying a Triple Zero Emergency call.” But for entertainment and educational purposes? I can do that. And it looks like the ol’ OpenBTS is gunna get a shot in the arm. The biggest thing for me right now is money – or lack thereof. The unsuccessful court case left me broke as a joke. Not to dwell on it, I’m putting the last of my money into what I think should be a surefire way to print money: NBN installations. I’m not going to go into the rationale for it here, but lets just say, its a regional job doing what I love the best: telecommunications. I love fibre optics, as much as I rant about radios and cellular networks. There should be ongoing work in the future in maintaining the network. I just gotta hold off spending any real cash on anything other than getting my courses and gear. And that will be… uh… hard. Plenty of toys out there to spend it on, take my links for example. But I have a good computer, I have a good phone, I have a Cubieboard, a RaspberryPi, and a ODROID-X to play with, two Simoco SRM9000s, a GNU Radio and a Radio Thin Client Module – this should be enough to keep me going for a while I reckon. The boys on the app_rpt list have come to the fore, although some of them need a little more convincing – a Cubie is almost the same specs as a BeagleBoard-xM. Trains? A couple of last ones. Then its save, save, save. I have a pre-order on a pack of Pacific National “Batwing” coal hoppers, good stuff, that’ll go well with my 92 class, and my 90 class when I get it. I’ve changed my order to an SCT class in the meantime, I’ve got a four pack of SCT wagons coming, and I plan on getting some Multi-Freighters, and some Greater Freighters when they come out. $60 odd a pop, one every couple of weeks, I’m sure I could afford that. Russians? They’ll have to wait till after the business is running. Hell, I have two employees lined up if I can pull this off. And I reckon I can. Everyone is telling me it suits me right down to the ground, and I should do it. Grace? In her good time. I’m sure another two years won’t hurt her, shes waited almost thirteen now. She still puts up with me, I hardly put up with myself. I kind of can’t walk away from myself – hmmm. Now phones? Well, thinking that I should get an Arduino board of some description, some of the battery boards I linked to (stack ’em on top of one another, increases current – they’re in parallel! ), and this new GSM/GPS module. Sure, it won’t look pretty, sure, it won’t exactly be portable as such, sure, I’m going to have to program in everything that a phone needs to operate (try doing an SMS editor – “Burn!! !”) but I think I’m going to have alot of fun. Who else can say “I design my own mobiles, and run them on my own mobile phone network”? Cubieboard is now running Linaro Ubuntu – the Allwinner A10 specific distribution. Serial console is a bit loopy – I get debug, no login. Ethernet doesn’t come up – something about the IRQs? This is all bad news, but someone, somewhere, has to have these issues. And fixed them. Saw some stuff like routers, APs and switches for NBN structured cabling/ access work, they’re all from Ubitquiti Networks. The UniFi APs, the EdgeMAX routers, and the ToughSwitch switches. I can see I’m gunna need a DJ rack when I move – seems theres a Jaycar in Maitland. I can see I’m going to become good friends with the owners and staff there. Found out about NoISP – http://www.noisp.coop/ – who do NBN fibre and fixed wireless packages. Tried finding out about Band “3” and Band “40” FDD/ TDD-LTE modems, no one is making them yet… or at least, not in that combination. You’ll see! I’ve done some good research on the TDD-LTE fixed wireless for the NBN, theres alot more to find out about yet, but to think I influenced the decision to use 2300MHz in 2004! Yeah, I am infamous, just you don’t be telling anyone…! I’m easy too, but if you tell anyone, we might have a riot on our hands. This is just the random crap of three weeks worth of research, soldering, travelling to Beresfield, Morisset, Dural, and back to Lithgow, Christmas watching too many “Is it a good idea to microwave this?” on Youtube (don’t ever give three engineers unlimited broadband on Christmas Day – bad! ), getting my ADSL fixed, and trying to live a somewhat normal life in between. All in its good time folks, all in its good time. It will be supplemented with additional boxes, of which I will initially have two (kind of a bit pointless to demo a voting network with only one station). Most likely Andrew will hold the additional boxes, and he is considering getting a four line GoIP where I only have a one line GoIP. Of course, mine is more of a demo, but can be pressed into service on the fireground. The whole system is designed to run off a 12VDC power source – for testing purposes, this is a 13.8VDC power supply, out in the field, it’ll be a 12VDC LiFePO4 or SLA battery, although the lithium battery is preferred, as it will allow me to monitor the voltages of the individual cells accurately. Andrew has talked about getting 2VDC lead acid cells, but I think it most be a bit more costly than what we both think. The CubieBoard will run custom software including Allmon (VoterMon) and my own power monitoring software. Into the fray is the revelation that app_rpt now does run on ARM devices, so summarily I believe that chan_voter could be coaxed into working too. The ARM version of app_rpt (which I had my hand in, Hi App_rpt Mailing List!) is under heavy test and doco work before it becomes an image ready for release. Ramesh, of Freestar.us, is leading the charge there, with able assistance by Jim – its Rameshs RPi, but Jim has been doing most of the configuration. We’ve had a couple of updates from the boys – good work so far! In other news, just three days before I found out about the charge to ARM, I had ordered a Fit PC-3 which may be now surplus to requirements. I do have a buyer already if it does in fact turn out that way. With that money, I’d like to get an Arndale Board (www.arndaleboard.org) for the set up of my “Hackers Tablet” – a super charged demo system for power users. So I haven’t been sitting still, as you can see! I also got my LEA-6T kit today, that’ll be heading back down the Mountains on Friday, to Carmel, so it can be assembled. It’ll be a vital component in the RTCM/ VoterCard system, in fact, I may use it in the box #1 rather than the stopgap Adafruit GPS I’m getting (the Adafruit GPS has a 1PPS signal, but no frequency output). 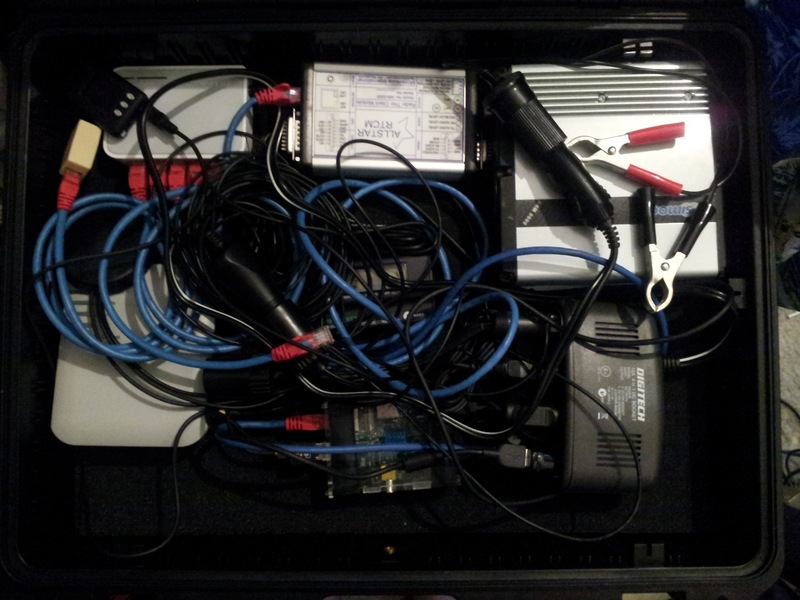 Of course, I’ll need a set of cables for it all, and that’ll have to be made over the Christmas period. I’ve also used my knowledge today of getting IAXRpt working under OS X 10.7 Lion to advantage by helping a Canadian amateur with his install. Using the stock Winebottler, WiNE doesn’t have sound enabled – since it is for OS X 10.4 – 10.6. Only the 10.7 version of WiNE adds sound support. This can be done by downloading your usual Winebottler software, then downloading the 10.7 version of WiNE from http://mirrors.nolabelstudios.com/mikesmassivemess/files/Wine_1.4.1.dmg. Replace the version of WiNE that came with Winebottler with the one you’ve just downloaded, and enjoy! Not doing too bad these days, eh? We lost the court case. And we lost my inheritance as well as my mothers house. I’m trying to be constructive about it, but I gambled, and lost. This is why I normally don’t gamble. Now thats out of the way, to be constructive, even though I got as crook as a dog afterwards, I have thrown myself back into my work. To that end, I’ve been ordering parts, and consulting with a number of people about the design of VoterCard. Andrew has been helping with the GPSDO design and filter design, Holger from Sysmocom has talked to me about the GPSDO itself, and recommended the Sydney hackerspace Robots and Dinosaurs (R&D) to help out with the construction of the GPSDO. I’m waiting to hear back from them, along with the status of my standing invitation. I’ve also found out my little cousins partner, and my nephews stepdad, Bobby, is particularly interested in audio engineering and car modifications. To this end I’m letting him in on VoterCard to show him how the the design and prototype process works (for myself at least), and how to consult with various people about aspects of a project. I’m looking forward to working with Bobby closely on VoterCard and anything else we dream up in future – Bobby wants to have beat synchronised EL wire controlled by an Arduino. Additionally, Christmas is coming up, and I’m actually looking forward to it this year. Not only do we have little Lachlan, my nephew, to celebrate for, I have an invitation to Andrews parents famous Christmas party. Wow, I’m spoiled this year! Now, what am I going to get Andrew? I’ve got Lachlan, Bobby, Renea and Carmel all sorted. Just Andrew, Dave, Jason and Nathan (as well as Jen and Wes, I’ve sorted them though, just got to get the stuff) to get presents for now. Back to the “Voter” products, I’ve become aware of AllMon, a webserver for monitoring app_rpt instances over a network. It also works with chan_voter, meaning that VoterCards can be monitored! This will prove invaluable over the coming months as I assemble and then start testing the VoterCards. Additionally, VoterApp is the server that runs all the software related to directing and informing the network of VoterCards. Although it may go through a number of iterations, the end result at this point looks good – tightly integrated. Another outcome of this will be, once I’ve gotten my cabling licence fixed up (later today I’ll send the paperwork for that), and my green provisional drivers licence fixed up I’m going to work on getting my Standard Radio Licence. I am, as a result of VoterCard, needing to legally modify radios, and I don’t want to use “the loophole” to do so, its such a pain in the rear. Of course, theres more, but this takes care of the ethernet interface, and the DSPiC CPU, as well as the programming interface for the DSPiC. I have MPLAB X on my Macbook, and I can get the firmware for the RTCM, which is what VoterCard is based on. Andrew has promised me we’ll get the signal generator out when it comes time to test the oscillator part of VoterCard. I’m looking forward to it! This gives me a 14.4MHz sine wave output (after filtering the third harmonic of a 4.8MHz square wave) and a 1PPS signal for the DSPiC. Of course, this is where R&D comes in, I haven’t built anything like this, in terms of surface mount, before, and I’m not feeling lucky lately. Especially at the price its at. If I keep going the way I am now, I may have a prototype of VoterCard by June long weekend next year, when Andrew and I may be going out camping to test the radios in prep for Expedition at Marramarra next October. If I do, I will be a very happy man! Ok, so I’m continuing to bounce around. Less than a week to court. Grace isn’t coming over for my birthday. RPi has had an open source release of GPU drivers. RTCM is being redesigned by myself and Andrew. I may be looking at a job as a tech. It is all happening! An aside: “Silent Force” by Within Temptation. An additional aside: got my cabling licence. The GPU release is interesting. With the RPi/ URI project, I’ve run into problem after problem related to the custom kernel used on Raspbian, and how theres no kernel package for it, nor does the git take when you download it. I was just about to give up, when I realised, I’m dealing with a PS2 Linux kit here. Yup, its not open source. Or it wasn’t open source. Four days ago, the software needed to open source the bootloader, and thus open source a “standard” kernel was released. Ok, its only been four days, and I can’t expect that much of a miracle, but I’m expecting a release of Raspbian with a standard 3.2 kernel, not the custom 3.2.27+ kernel, may be released soon. And here I was thinking Plan 9 on RPi would be nice… idiot! I’m going to have to download everything again, of course. RPi, by the way, now has 512MB RAM, and no increase in price. Local stocks in Australia. Win. I don’t mind downloading a standard release of Raspbian. Ive got another Class 10 microSD card, and I have the “half length” microSD adapters designed specifically for RPi coming from Adafruit, along with other goodies. You live, you learn, you love. And if you’ve made even just one step at the end of the day, you’ve done something worthwhile. Thats the output of a Navman Jupiter-T. 10kHz. That could be fed into a 14.4MHz VC-TCXO, and then patched into the oscillator section of a Simoco SRM9000. Enter “VoterCard.” And no, I don’t work for the Australian Electoral Commission. One of the big things, Andrew said, with the RTCM, is the fact the radios oscillators aren’t synchronised over the distance. So a Jupiter-T will give us a 10kHz output, and a 1PPS output, which is needed by the radio and the RTCM respectively. And the Jupiter-T is only $66 delivered. Win. Damn Andrew, you have an eye for bargains. So, the redesign of the RTCM? Well, I want to throw all of the components not inside the radio itself into one box, and not have a million wires and cables dragging all over the place. This thing is plug and play to the max. I’d also like to have a crack at making an RTCM out of through-hole components. Breadboard? Yes please! Now the job? My my, I get myself into some amazing gigs – imagine me running the IT&T resources of a dispatch centre. Thats computers, telephones and radios! I’m a bit annoyed at this court thing being this week, I may have been getting a call – I’ve told them can you shoot me an email, I might get out early on Friday, and be able to call them back. Good little boy that I am – wheres my scotch?! Its kind of amazing, some of the doors that open before you. Once you catch a glimpse of what lies beyond the doorjamb, you wonder how your life was like before it. Point in case, the “Radio Thin Client Module” (RTCM). Oops. Now I’ve done it. Andrew at this point reminded me kindly that a voting system would be prohibitively expensive to implement, not to mention the proprietary nature of such a system would not be easily transferrable to any other system. http://micro-node.com/thin-m1.html should cure what ails you. In essence, the RTCM is a PIC micro controller with an ethernet (for VoIP and Telnet) interface on one side, and a audio (for the PMR radio) interface on the other side. A bit of magic in between, and we have something like a GoIP GSM to VoIP gateway, but for PMR. But while this is incredibly cool, it doesn’t stop there. It goes on to allow an open source way of having a voting radio system over LAN (wireless or not, you choose) and VoIP! Preliminary costs for a single site, set up at my house under test conditions, with all the bells and whistles is a bit much, and has totally nuked my “Get a slate PC” fund. But hey, my Macbook Air is still going strong for the time being, and the electric car is a fair way off (middle of next year at this stage, if earlier I’ll be a happy man). In any case, I know that electric car won’t go anywhere without me placing a chunk of cash on a table, so I’m covered there. In the meantime, I want to set up a remote base at my place, and at my mothers place which is 800metres away as the crow flies from my house, and with a decent sized mast (10metres high, say) one can make a long shot wifi link work just fine. The motivation, especially at my mothers place, is to make sure the remote base can operate “off grid” – that way I’m not paying for electricity I don’t need to. This also promotes the use in the middle of the bush, no handy power points out there! Apart from the actual PMR, wifi and GSM/ VoIP radio systems, I plan on having a set of interfaces to the lithium batteries and the solar controllers that will power and store energy for the remote bases. The eventual goal there is to have power generation and consumption information available on a webpage as a series of figures as well as graphs. This’ll be able to be accessed anywhere in the world via a 3G or internet connection. Additional to that, using VoIP, I could literally log in to my network from the “Greater Internet” and use the PMR system at home, and broadcast my voice on whatever channel that the system happens to be set on. Using Simoco SRM9000 radios, I can control them via computer. So, in terms of computers, what will I need? Now, I’m looking at my options, in terms of having an Atom computer with an SSD and a DC-DC power supply as the radio “director” (chan_voter, as well as app_rpt), and having Pis look after the power monitoring as well as some other housekeeping at the remote bases. This’ll all be connected, eventually, over Ubiquiti Bullets which will be arrayed for long shots – be it be 800metres across my suburb, or 5km across Marramarra. I have some equipment already, the Simocos are an obvious one, I also have a 3G yagi antenna (technically for 850MHz, I’m sure it’ll push to 900MHz no problems), and a few other odds and sods. Most equipment will be purchased new though. Andrew may end up purchasing some equipment too, and we would pool them together on an expedition for the common good. Of course, at the end of the day, I’d like a working system to demo to anyone whom I think would be interested in it.